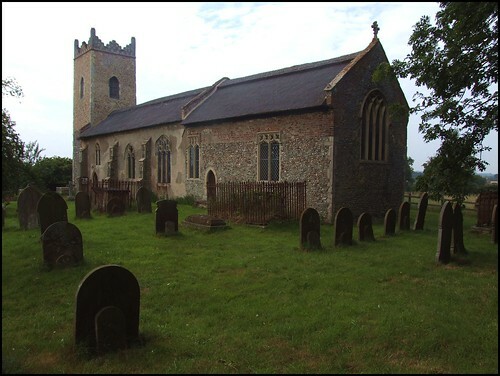 The name is strange - it is the Saxon word for a thorn bush - and this is a remote parish which seems as much water as it does land. Narrow lanes roll into the surprise of a fairly busy village, and that is because it is a popular stop on the Broads - people tend to arrive here by boat rather than by road. There's a good pub down towards the staithe, but St Edmund is on the hillside above the village, out in the fields. 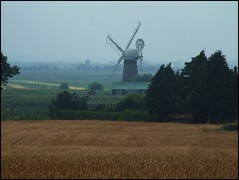 From the bank across the road there is a gorgeous view of the parish's most famous feature, Thurne windmill, with the ruined Abbey of St Benet in the haze beyond. Coming here in the late summer, the trees restless and the dust from the harvest suffusing the air, it was like stepping into a Song from the Auvergne, a sweet sadness I feel every year as the nights begin to draw in, and magnified here in this late afternoon. Thurne was our last church of the day before heading back to Norwich and the train, and I stood on the bank looking out across the great flood plane of the Yare, thinking to myself that the next time I saw Norfolk it would be autumn again. St Edmund is a small, simple church, like so many around here. The roofs are thatched. Nothing much happened here after the Black Death: there is some fine 15th century tracery in the windows in the chancel, when the roof appears to have been raised to accomodate them. But essentially, this is just an elaborated late Norman building. There is one great curiosity: a long, circular squint runs eastwards from outside through the western wall of the tower, lining up on the altar in that direction, and on St Benet's Abbey in the other. Almost certainly, it was to create a kind of sacramental connection between the two. When we visited, a pigeon had nested inside it. 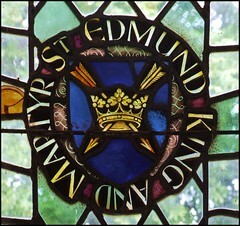 And, like so many around here, St Edmund has a plain and simple interior, obviously well-loved and looked after. Oil lamps hang from the roof above simple 19th Century furnishings. A double piscina of the late 13th century is the earliest surviving enhancement to the original structure. From a couple of centuries later, the original rood beam is nicely set off by the simple roofs. Perhaps the best single feature of the church is the east window, with a striking Noli Me Tangere by Martin Travers - Mary Magdalene meets the Risen Christ in the garden and recognises him at last. 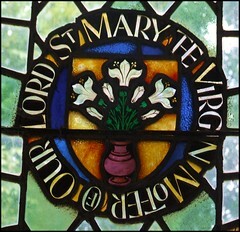 On either side, roundels to St Edmund and the Blessed Virgin are full of mid-century confidence. It would be interesting to know how the work of such a major artist came to be commissioned by such a small and remote parish. And so, that was it. Norfok for another summer. All over the Broads, the last fortnighters, weekers and weekenders would be steering their boats back into Wroxham, Potter Heigham and Ludham, and setting off home for the Midlands towns. The countryside would be stripped of its riches, to lie empty under the lowering skies. The earth would be turned like rich fruit cake, and the skeletons of trees, which had seemed so full of abundance just a few weeks before, would be a stark punctuation across the land. Breathing in the cooling air, I could sense Norfolk closing in on itself again, settling down in quiet solitude for the onset of winter, darkness falling increasingly swiftly across the bare fields.